This grilled peach salad recipe makes the most out of late season peaches. The heat of the grill caramelizes their natural sugar and gives them an even “peachier” taste. It’s a great way to hold onto summer for just a little longer. The smell of fresh ripe peaches is sort of a time machine for me. It instantly transports me to childhood summers spent with great-grandma. Every time I pass the peaches in the produce section I think of her. I think of raking leaves from her pecan tree into giant piles to jump in; curling up in her lap to listen to stories told just for me; sitting on a stool in her kitchen watching her can peaches. 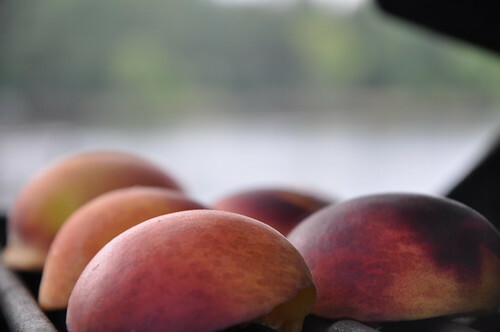 The shelves on her back porch were stacked with shiny jars filled with the colors of summer that she “put up” against the leafless winter; green beans, tomatoes and my favorite… peaches. I’ve walked past the peaches in the grocery store for months now. Wishing I could make her warm peach cobbler or her famous peach ice cream. “Soon,” I say. “When I’m thinner.” I put the memories away and move to the iceburg lettuce and cucumbers. 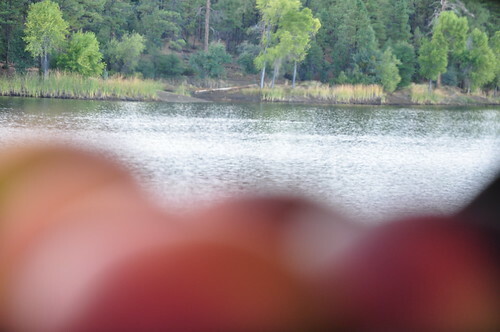 Today, I stopped to smell the peaches… determined not to let summer pass me by. No peach cobbler, though. 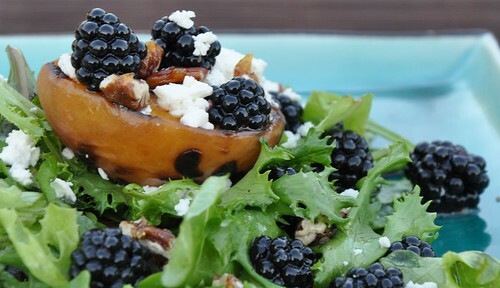 Here’s what I came up with instead, my Grilled Peach Salad with Goat Cheese, Blackberries and Lemon Vinaigrette. Cut the peaches in half and remove the seeds. Brush them with a little vegetable oil. Place them on a grill over low heat. I usually grill them last, when the coals are about to die out. Grill the peaches cut side down until grill marks form. Be careful not to burn them. Turn the peaches over and grill on the other side. 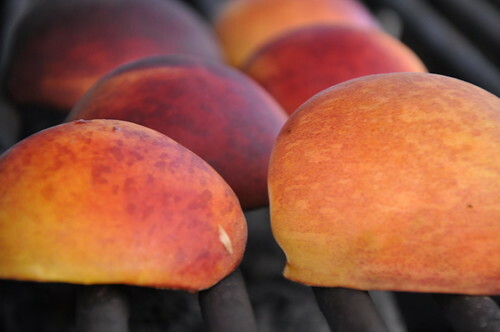 Grill until the peaches are tender. While the peaches are grilling, mix the vinaigrette together. 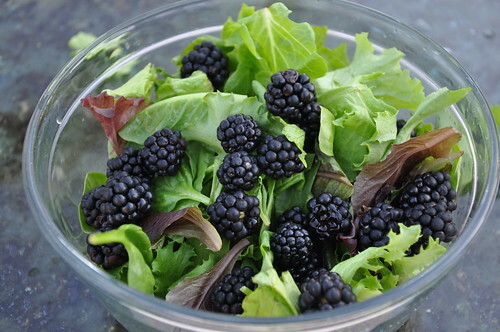 Toss the mixed greens and blackberries together. Dress lightly with the vinaigrette. Plate salad and place one peach half in the center of each salad. Sprinkle with crumbled goat cheese and candied pecans. Cut peaches in half and remove seeds. Brush with canola oil. Grill cut side down over low heat. 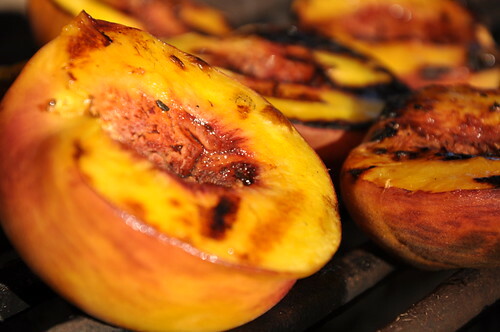 When grill marks form, turn the peaches and grill on the other side. Be carful not burn them. Remove from heat when tender. 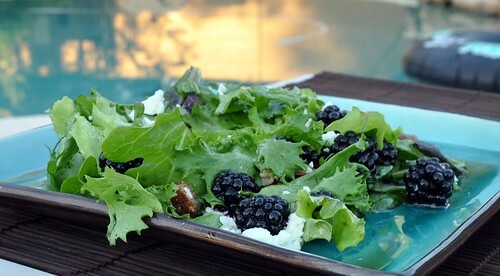 Toss together mixed greens and blackberries. Dress lightly with vinaigrette. Divide greens onto plates and top with a warm peach half. Crumble goat cheese. Sprinkle goat cheese and candied pecans over salads. Finish with a squeeze of fresh lemon juice. Zest lemon and cut in half. Squeeze 2 tablespoons juice into mixing bowl. Reserve the unused lemon. Add champagne vinegar. 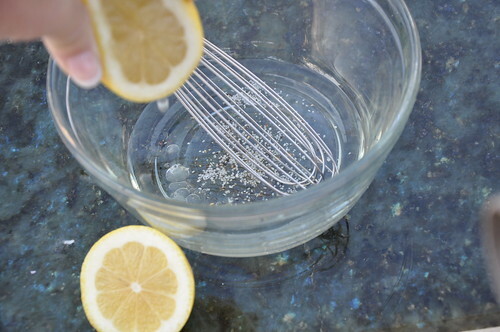 Whisk in oil and add lemon zest. Season with salt and pepper. Salads aren’t the only way to eat grilled peaches, here are some other ways to work peaches into your life. Looks so yummy! 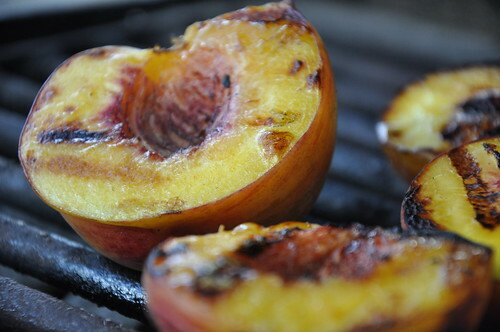 I discovered grilled peaches a few years ago and LOVE them this way. I am drooling looking at your peaches. Must make this before they disappear from the stores! Kelli, I have seen your roundup! 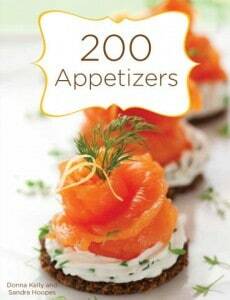 You have soooo many delicious recipes for spring! Thank you for including this peach salad.